suppose it has a fixed width, and each row has a “core” minimum height it needs. you have some priorities – first give row #1 extra space, then row #2 any extra. 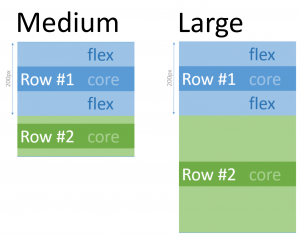 XAML makes it easy to do proportional space allocation – e.g., give row #1 two-thirds and row #2 one-third by giving them “2*” and “*” height respectively. But it doesn’t do priorities. Essentially, row #1 gets “first claim” on any extra space, up to a limit of 200 pixels. Any extra space beyond 200 pixels falls over to row #2.